Fresh off a trip to Memphis to revisit his old stomping grounds—literally—Scott Bowden returns to LA and the KFR Podcast approximately 9 pounds heavier from all that country cookin’ and jivin’—and yes, even a little moonshinin’. As his eager sidekick, the Great Brian Last, hangs on every pause, Bowden spins tales about the glory days of pro wrestling in the South’s most infamous arena and some of the legendary backstage gossip that used to fly around the building like Mil Mascaras sailing from turnbuckle to canvas back in January 1979. Not only will the KFR Colonel guide you through an empty arena—MY EYE!—but Bowden will also explain the emotions and memories that came flooding back, some of which surprised the cold-hearted, diabolical manager from Germantown. Also, Bowden makes like his favorite wrestling journalist—PWI’s hard-drinkin’, hard-workin’, liver-not-functionin’ (and not actually existin’) sage columnist Matt Brock. On this episode’s Anatomy of Angle, Bowden looks at one of his favorite ’70s Memphis heels of all time who made an expected babyface turn in 1985, returning the perennial Southern tag champion back to main-event glory, this time as a singles star as well as the partner of Jerry Lawler to pluck and fry the evil Freebirds, Phil Hickerson. 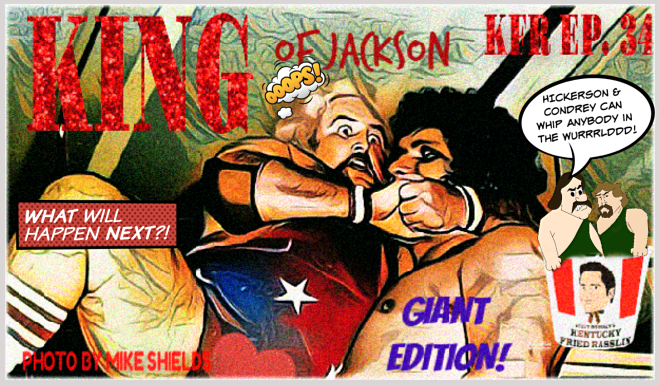 In the end, the Rodney Dangerfield of Memphis wrestling finally earned the respect of the fans as the King of Jackson, Tenn. KFR is also serving up a heapin’ of rare WHBQ audio, including a promo by a young, nervous and downright humble Hickerson with Lance Russell that hasn’t been heard in 40–plus years. Bowden also shares the full story on the infamous November 1976 Memphis Magazine cover featuring the King wearing the NWA’s crown jewel—the 10 pounds of gold—for a quick photo shoot following only his second bout ever with World champion Terry Funk in October 1976. This was, quite literally, Lawler’s only “run” with the NWA World championship belt. All this and more episode 34 of the KFR Podcast!